EDITOR'S NOTE: A prior video version of this story may have created the impression that Dr. James Gatza was involved in litigation with three women featured in the story. To our knowledge there is no litigation between Dr. Gatza and any of the women. 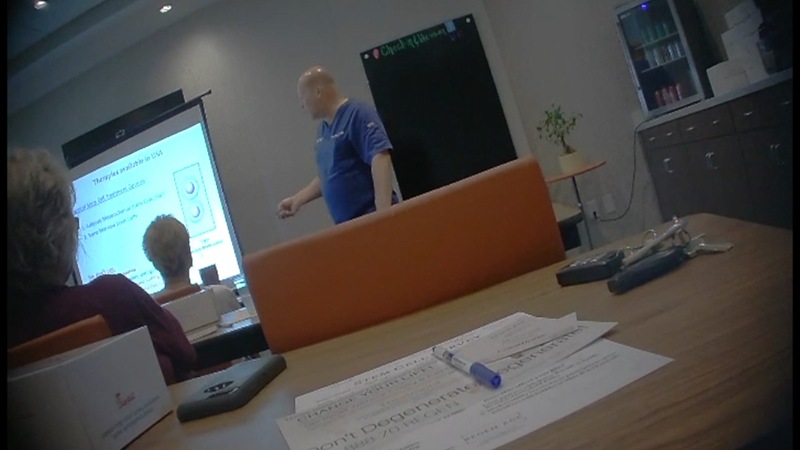 TAMPA, Fla. -- In a conference room of a Tampa hotel about 20 people gathered on a weekday afternoon to hear a pitch for stem cell therapy. The promising medical treatment currently has limited FDA approval, limited use and little proof it works for most conditions. But listen in on the pitch for stem cells from a clinic and perhaps it’s no surprise why desperately seeking patients are spending thousands of dollars out of pocket believing this “miracle treatment” could help a variety of illnesses and ailments, even diseases for which there is no cure. “They told me I would feel so much better,” said Maureen Rosen who suffers from chronic obstructive pulmonary disease (COPD) and sought stem cell therapy after hearing a pitch by the Lung Institute in Tampa. “They said it would help,” said Dorothy Carver who also listened to a pitch by the Lung Institute during a separate seminar in Ocala a few years ago. Carver‘s husband at the time was dying of lung disease. So was Olga Cassady‘s husband who also heard and fell for the pitch. “He'll definitely get some kind of improvement, that's what they told me,” she said. Last month we shared their stories, the treatments they say were a dud and their class action lawsuit, one of a growing number of lawsuits accusing a Florida stem cell clinic of deceptive advertising. This month, we wanted to know more about the sales pitch reeling vulnerable patients in. We found stem cell clinics online offering free educational seminars and attended several including a few for Regenerative Medicine & Anti-aging or Regen-Age.com in Pinellas County. It touts stem cell therapy for everything from skin issues to body pain. “We’ve been studying stem cells for the last 25 years here at the University of South Florida,” explained Dr.Cesario Borlongan, a world renowned stem cell researcher who has devoted himself to studying how stem cells could help stroke patients and other patients suffering from brain disorders. Borlongan says stem cells therapy for most conditions is still at least 5 years away from being tested on human patients. So far the FDA has approved stem cell therapy for some blood disorders and blood cancers. “Even for myself and my family I wouldn’t advise them to have stem cell therapy,” he said adding “my worry is the stem cell clinics are really putting the lives of our patients at risk,” he said. Dr. Borlongan agreed to join us at a seminar being offered by Regenerative Medicine & Anti-aging. “I’m hoping the stem cell clinics will be truthful in what they’re providing,” he told us before the seminar. We arrived at the hotel shortly before the 1pm session. Inside, a small spread of food was offered to those in attendance. Before the seminar began, the host dressed in doctor scrubs warned the small crowd not to record. The presentation, he said, is proprietary information. We managed to find his same script over and over again online where we also learned the host, whose name is Dr. James Gatza, owns a number of other companies including the Florida Wellness Institute where the stem cell therapy is offered. We also learned he is a licensed holistic Florida chiropractor who claims he doesn't see patients anymore. According to his bio on the Florida Wellness Institute’s website, Gatza serves as the "national spokesperson for the Stem Cell Institute of America," a Georgia-based company that describes itself online as a nationwide educator and referral company for stem cell therapy. For about an hour, Gatza talked up the benefits of stem cell therapy and the science behind it. His only evidence came in the form of before and after x-ray photos and his own experience. At no time, did he disclose the treatments are not FDA approved. He acknowledged that stem cell therapy is “not for everyone,” and generalized overall patient results as phenomenal including his own experience. Gatza said he was injected in both knees after years of football and tennis wreaked havoc on his knees. Ever since the injection a few years ago at a clinic in Chicago, he said he hasn’t had any pain and his activity is back to normal. Gatza said he would not take questions during his presentation but quickly added that he would answer questions individually after the seminar. At the end of the pitch, he directed the mostly senior citizen crowd of attendees to a back table to sign up for a free consultation. Something we also heard at other seminars he held over the last few weeks. “We will do a consultation for you at no charge, it's normally $250," he said during a similar presentation we found on the company’s Facebook account. “Did you think that was a hard sell,” Katie LaGrone asked Dr. Borlongan after the session. “Definitely yes, it's an oversell of the stem cell treatment,” he explained. Gatza claimed the clinic had its most success with amniotc stem cells which are derived from the amniotic sac after a "healthy mom delivers a healthy baby." Dr. Borlongan believes that kind of injection requires FDA approval since the stem are not originating in the patient. "There’s an opportunity for adverse effects, when you’re transplanting mismatched cells from one to another," he said. "He's putting patient's lives at risk," said Dr. Borlongan. Borlongan also disputed Gatza’s claim that age doesn’t matter. “Age does matter in the lab but not at this pitch,” said Dr. Borlongan. Even the evidence- a before and after knee x-ray —Dr Borlongan is skeptical. “It's a disservice to science and we're putting human lives at risk,” he said. We caught up with Dr. Gatza moments after another one of his hotel seminars. “I was just curious where’s the evidence,” reporter Katie LaGrone asked him when confronted. “Before we do this can I talk to you for a second,” he asked. “He [Dr. Borlongan] heard the treatment and, quite frankly, described it as voodoo treatment, what’s your response to that,” asked LaGrone. “Well that’s not the way I see it. That’s not the way I see it with our patients,” Dr. Gatza told us while getting into his car. Dr. Gatza then rolled up his window and refused to talk to us on camera. “It is a sham and we’ve got to put a stop to it," said State Senator Dana Young who believes overselling the use and impact of stem cell therapy is so rampant in Florida, she introduced a bill to stop it. “They are being led down a primrose path of believing that when there are no other traditional medical treatments available that somehow if they get these stem cell treatments they will find a miracle cure,” she said. Dr. Borlongan agrees. “So you’re saying what he's doing in that pitch was just dangerous,” asked LaGrone. “That's dangerous,” responded Dr. Borlongan. But as we saw in person and online, not if you’re the one selling it. “Why don’t you disclose that it’s not FDA approved.” asked LaGrone. “The only thing I want to say is all I want to do is help people get out of pain. That’s all we want to do,” Dr. Gatza said. Stem cell therapy is rarely covered by insurance. Senator Young hopes to introduce the bill again next year. It would require clinics to register with the state, be owned and operated by a licensed doctor and abide by advertising rules that include disclosing if treatments are not FDA approved.